Breakthrough Stage 2 Pain Relief for Moderate to Severe Pain! No other over the counter pain reliever can claim this! 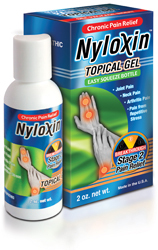 The Nyloxin Topical Gel is formulated to aide skin penetration with no scent or dyes. It also is non sticky and non-staining. Nyloxin Topical Gel is prepared according to the requirements of the Homeopathic Pharmacopoeia of the United States (HPUS) and its supporting texts.